Welcome to our home on the web. We have put together a few pictures to offer examples of some of our more popular products and services. Please feel free to browse away but be aware these are only a few examples. We invite you to contact us with any questions you might have. 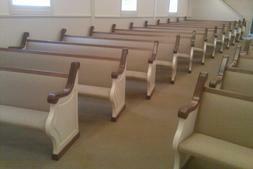 We would love to help you find or design the perfect pews for your worship space. 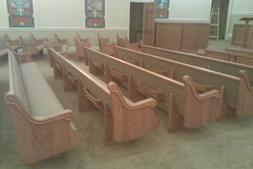 We are a manufacturer of fine handcrafted solid wood church pews and furniture. All of our stained ends are manufactured using the highest quality fas grade red oak. All of our supports are manufactured of the same quality solid red oak. 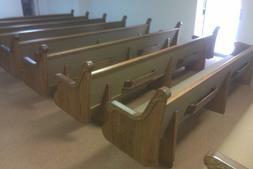 There is no veneer in any of our pew ends. The cap rail is manufactured from the same quality solid oak along with all the exposed trim. 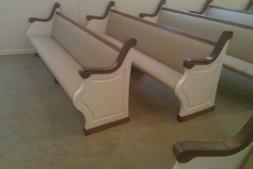 Please see the pew end page for pictures of available pew ends. 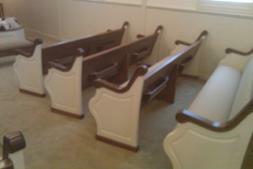 Also see the pew construction page for info on pew bodies. 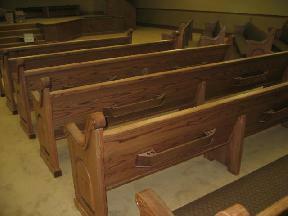 We are so confident in the quality of the products we produce, we stand behind every pew end, every pew support, every cap rail, every hymnal rack, every strip of moulding used to cover the screw heads, every seat core whether plywood or solid pine, every pew back whether plywood or solid oak, every wood part of the entire pew, with a free of charge, repair or replacement warranty for the life of the pew in the original building where we install it. If your church is located in MS or any surrounding state we are probably your best choice for new church pews.We supply church pews and pulpit furniture to the states of MS, AL, GA, TN, FL, LA, AR, eastern TX , and eastern OK. We sometimes even venture out a little farther. Call us at 662-724-4355 or email us pews@wellschurchfurniture for more information. 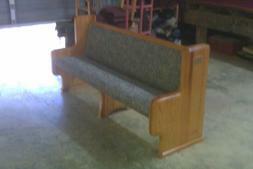 The Wells family has been building high quality solid wood church pews and furniture for over 50 years. We handle all the sales, manfacturing, installation, and support after the installation, ourselves. There's no outside contractors involved in any part of the process. We find this helps us in two ways. We have control over every part of the process. This helps us maintain a very high quality standard in both the furniture we build and also in the installation of the pews in your church. This also helps us keep our costs down in both the sales area (since you don't have to pay the sales reps commission) and also in the installation costs. We are able to pass these savings on to the customer. 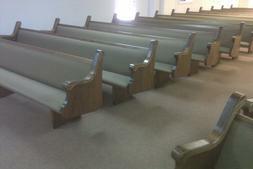 Therefore you end up with a pew that exceeds the quality of many at a price that is usually signifigantly lower. 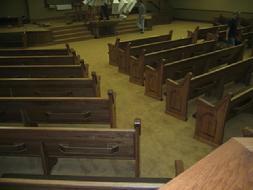 If your church is considering purchasing new pews or pulpit furniture, we ask that you give us a chance. We can probably provide you a lot more pew for a lot less money. We also offer complete pew restoration services including upholstery, re-upholstery, wash down and apply new clearcoat to wooden finishes, repair damaged peices. 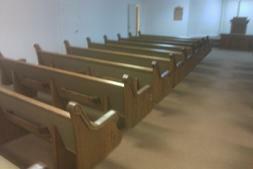 Church buildings come in all sizes and many different configurations. 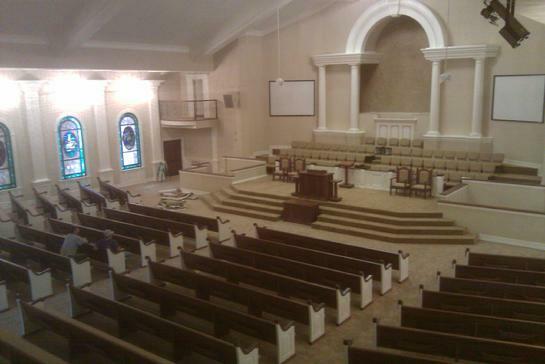 In over 50 years of building church pews we've worked in many of them, from the smaller rural churches to some of the largest churches in the southeastern U.S. We invite you to contact us and let us show you what is available. We can probably put you in touch with a church close to you that we've worked in. We've found that referals from satisfied customers mean much more than anything we could claim on a website. To download a powerpoint presentation for viewing on your church's media click the link below.